At NC SERVICE thanks to our specialisation in Machine-tools, we have developed a pro-active Preventive Maintenance service for a wide range of machines, to guarantee perfect conditions of productivity , functionality and reliability, whilst maximising the machine uptime for the customer. These Preventive Maintenance contracts offered by NC SERVICE include a wide range of options, adapted to the different life-cycle phases of each machine and directed at covering the production requirements of our customers, ranging from making mechanical or electronic adjustments, to geometric adjustments and verification. This predictive maintenance offered by NC SERVICE is adapted to each machine and part of equipment owned by each customer, and consists in the execution of a series of actions directed at either reducing or eliminating the most common and important breakdowns on each machine, and preventing deterioration. The planning of the retrofit (in addition to any repair work required) for our customer's machines, makes it possible to have the required spares available beforehand, and to always use the most appropriate human and technical resources for each specific case. Report on the machine condition and recommendations for corrective action (technical work) following each inspection. Diagnosis of a potential error in the working planes through a specific electronic system. Electronic adjustment of the movements and diagnosis of possible errors in the movement of the rotary axes, if the machine is equipped with the same. In addition to the tasks included in the basic contract, this contract includes the checking, and correction where necessary, of the machine geometry and the levelling of the machine, in addition to the calibration of the linear movements using a laser interferometer. In addition to the tasks included in the standard level, a dynamic adjustment of the machine shall be made based on its actual interaction between the mechanics and electronics. 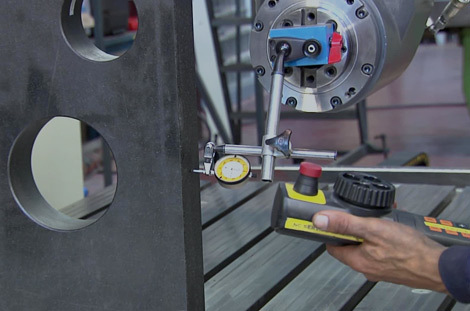 This makes it possible to set the machine to tolerances very close to the factory-set ones, ensuring productivity and accuracy. We also offer specific customised agreements, with any customer requesting this. If in the course of these regular inspections, NC SERVICE sees the possibility of increasing the durability of the machine components by upgrading either the electric, electronic or control components (greater smoothness and accuracy of movements) or improving the availability factor (motors/drivers that have become obsolete or are difficult to replace) then the customer shall be informed directly of this. We are firmly convinced that, by collaborating in this way, you will see an increase in your production capacity and, consequently, will be even more satisfied with the machine purchased. Please complete this form and we'll contact you as soon as possible.